So far that effort has proved scattershot, with each social media service attempting it's own variety. Reddit deleted subreddits, Twitter banned or shadow banned accounts, Google changed it's advertising policies and Facebook built a wall that China is going to pay for. The latest initiative would hand a huge pile of money to the State Department to create it's own fake news and call that “combating Russian propaganda.” The move is not without precedent in both the cold war and the no longer new war on Islam, or terrorism or something. On December 7 Hillary Clinton made her first public appearance without her handler Katy Perry since she gave Trump the executive power to push a $160 million State Department spending package to combat Russian propaganda. She sounded in support of this bill at a retirement event for Senate Minority Leader Harry M. Reid. Clinton cited the recent attack on the defenseless linoleum tile floor of a Washington DC pizza joint as the reason for this budget increase “Lives are at risk, lives of ordinary people just trying to go about their days, to do their jobs, contribute to their communities,” The highly scripted press event was given close coverage by the Washington Post, which has been linked to the national security establishment and caught illegally raising funds for the Clinton Campaign. The State Department under Clinton was criticized in 2013 for spending hundreds of thousands of dollars on fake profiles that would “like” America as a brand and friend embassies and public diplomacy personnel. 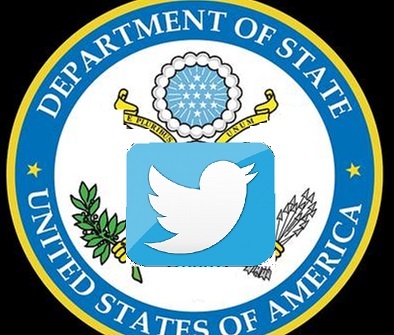 The new vastly increased budget would not target brand building for brand USA overseas, but would finance State Department propaganda directed at the American public. Targeting the American public for State Department propaganda was made illegal in 1948 and continued to be so until 2013. Thus after supporting Trump as the preferred nominee during the primaries, and having more editorial control over CNN's content then CNN, the leadership of the Democratic Party has now given a massive cash infusion to the State Department, with the understanding that this will be used clandestinely to define the truth. As the Trump administration enters it is being handed a massive budget to blast racist vitriol directly into the living rooms of the public. One can only imagine how Trump's twitter tantrums would be amplified by a cash infusion large enough to provide the City of Flint with a clean water supply. Luckily for the eardrums of those of us with an IQ above room temperature Orange Frankenstein's tiny fingers on the tweet button is not the intended use of the funds. Public diplomacy funds are intended to be used by a vast foreign policy bureaucracy for building global, and now national consensus around American goals in a diffuse manner. The use of these funds will be more subtle than nightly anti-Russian or anti-Muslim screamfests from the Oval office. These funds will replace “fake news” with well financed fake news in designed not to go viral in sudden bursts, but as control of the background dialogue that informs the views of global and American civil society. American alternative media will face an uphill battle. Already deprived of the level of funding that permits it the full time staff of the mainstream it will be forced to struggle harder for access to markets. Faced with eardrum pounding hate speech on one side, and being subtle gagged by Mark Zuckerberg's t-shirt stuffed in it's throat to the other, it will still persevere. Already an attempt to blacklist press outlets both left and right has been seen, and it is reminiscent of the Hollywood Blacklist of the 1950s. A free media survived that episode just as it survived outright censorship of abolitionist newspapers by post office 100 years prior to that. Student and underground newspapers were raided all through the 1960s. Some of those newspapers, like the Columbus Free Press still exist today despite outright repression. Slavery was still abolished by both acclaim and force of arms. Most of the stars blacklisted eventually returned to work and the makers of lists are scorned by historians. The unstoppable 'X' factor in this often rebooted adventure franchise is you, the critical thinker who consumes news, checks facts for themselves and engages in public dialogue. The public does not want it's news coming from the desk of Putin, or Clinton, or Trump or Jefferson Davis. The public wants the truth and is willing to fact check for itself. Despite the wishes of the Democratic Party the public is not intellectually lazy. Despite the wishes of the Republican Party it is also not semi-literate and star struck.